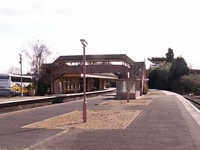 As a major town GWR station on an important through route to Bristol and the home of 'Shakespeare' - a marketing point not lost on the GWR - I was expecting something rather more grandiose than actually exists. 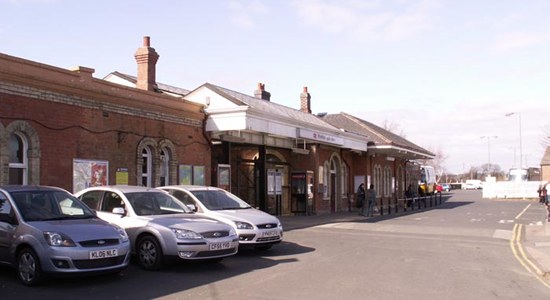 Opening in 1861, the current station was the third incarnation of a 'Stratford station' providing a joining point for the earlier constructed OWWR's line to stratford and the Hatton and Stratford Branch's line: both of which originally had short-lived stations of the same name at their termini. Unfortunately, over the years, the facilities at Stratford have gradually been eroded with it first losing its 'through line' status in 1962 with Southbound traffic being routed through the ex-Midland line from Birmingham New Street through Lickey Bank, and goods facilities being removed in September 1962. 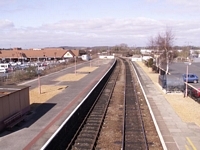 Above we see the station frontage off Alcester Road, showing a typical GWR style, with the site of the goods yard ahead and now partly covered by a car park. 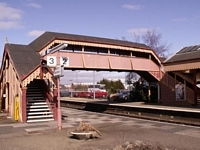 Above-left we have entered the station and are standing on the footbridge between platform 1 and the island platform, numbered 2 and 3, looking North. 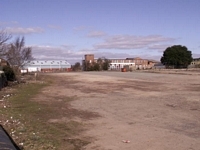 To the right we can see the site of the goods yard and sidings and to the left, the site of a Ministry of Food silo and distribution depot now occuppied by a Morrisons supermarket. 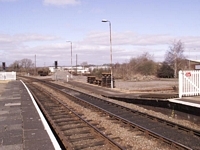 Above-right we are still on the footbridge but are facing South towards Honeybourne and in the immediate distance, exchange sidings with the East West Junction Railway. 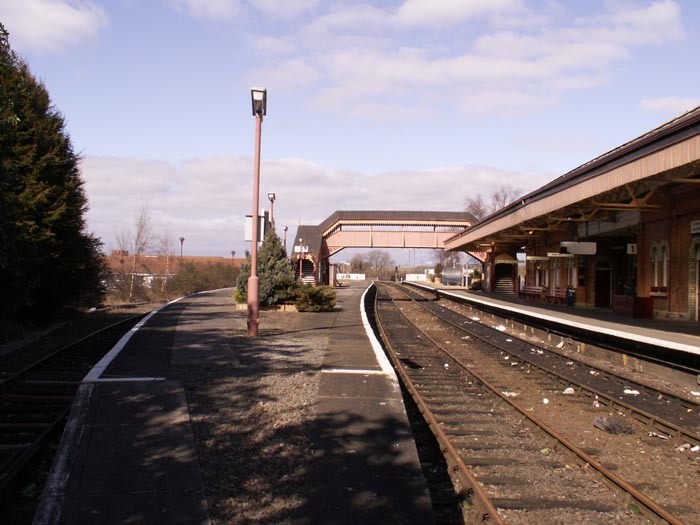 However, as was mentioned above, the passenger service ends here as does the line a short distance ahead. 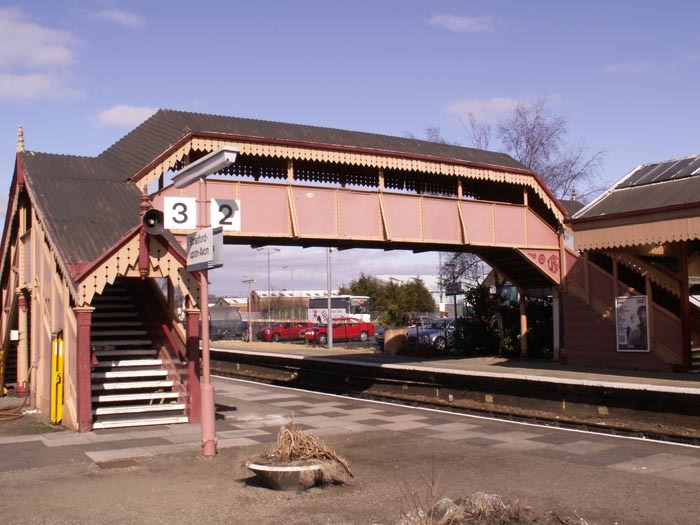 Above-left we take a close look at the most appealing feature of this station, and of many ex-GWR stations today, the footbridge. 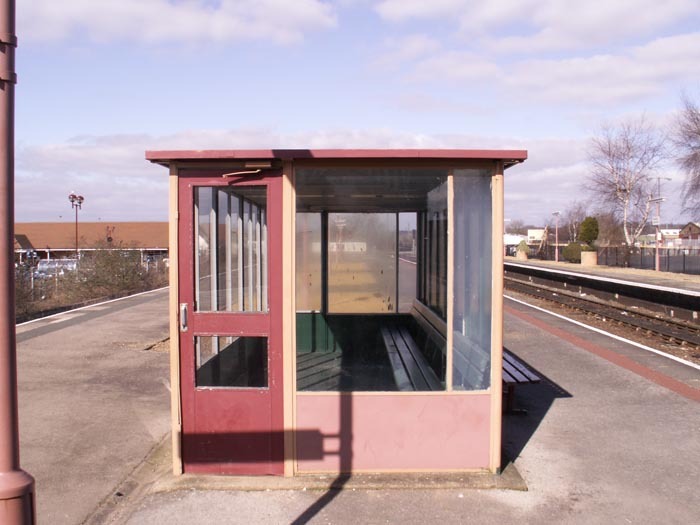 Above-right, in complete contrast, we see the waiting facilities proviced on platform 2/3: the bus shelter! Originally, this island platform had a major canopied waiting room with toilets etc . . . reminiscent of the building on platform 1, however, as was BR's penchant for bland anonymity, the structure was removed and replaced with the above! 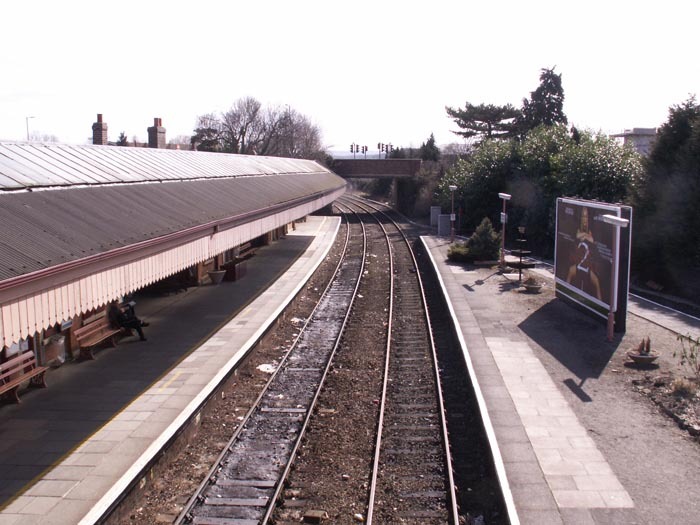 Above-left we are still on the island platform looking North. 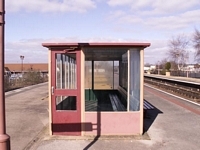 The platform 1 waiting facilities/booking hall provide an impressive site with the GWR canopy well maintained. 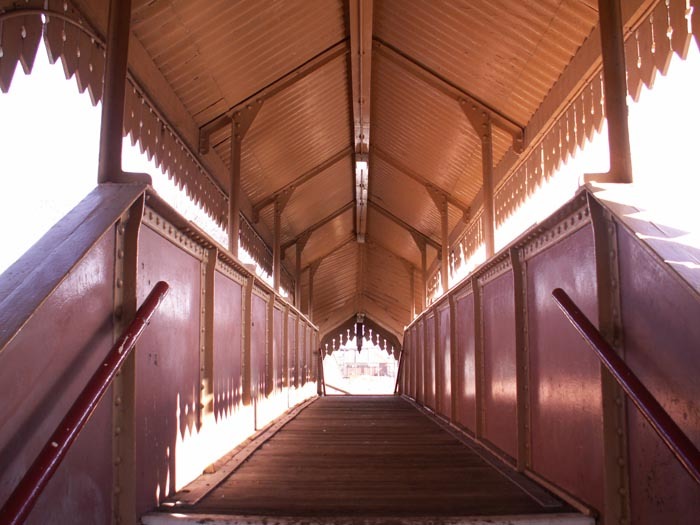 This view also shows-off the footbridge to good effect. 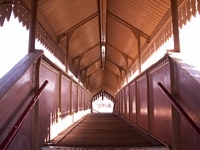 Above-right we take a closer look at the aforementioned footbridge which has not been amended since GWR days and has various GWR-related insignia enshrined in its wrought-ironwork which has been specifically highlighted during painting: it's at least good to know that some effort has been put into preserving the original feel of the station. 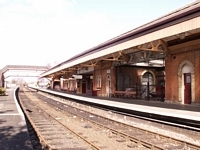 Above-left we are standing on the trackbed looking North with the line at platform 3 to the left ending in buffer stops and the main 'through lines' to the right. Above-right we are on platform 3 looking South - from this perspective the station looks a little swamped by its surroundings and we can see the site of the original platform buildings marked by the gravel patches on the platform surface. 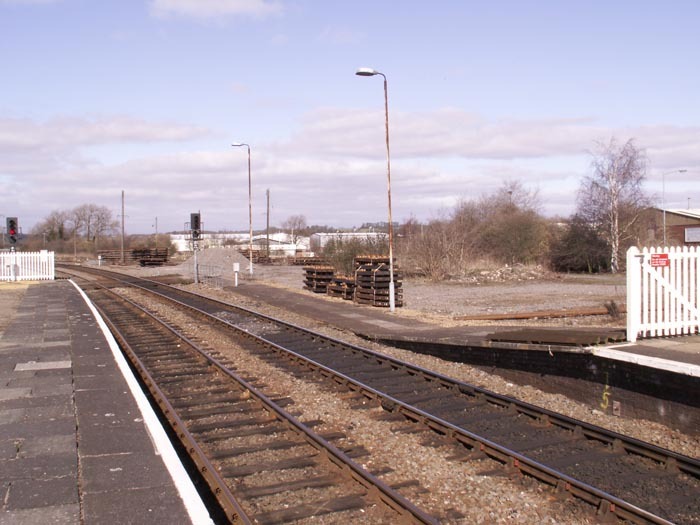 Above-left we are at the North end of the island platform and are looking at the now cleared goods yard which is awaiting development as a Steam Locomotive Centre for the Birmingham Railway Museum (at Tyseley): 'The Home of the Shakespeare Express'. It is, for once, good news that a disused area of a railway site is to be utilised once more for railway purposes: particularly that of steam traction. Above-right we are once again at the entrance to the station with the booking hall to our left looking our across part of the goods yard. This is an intersting site to visit and will certainly be worth revisiting as construction of the loco shed gest underway.